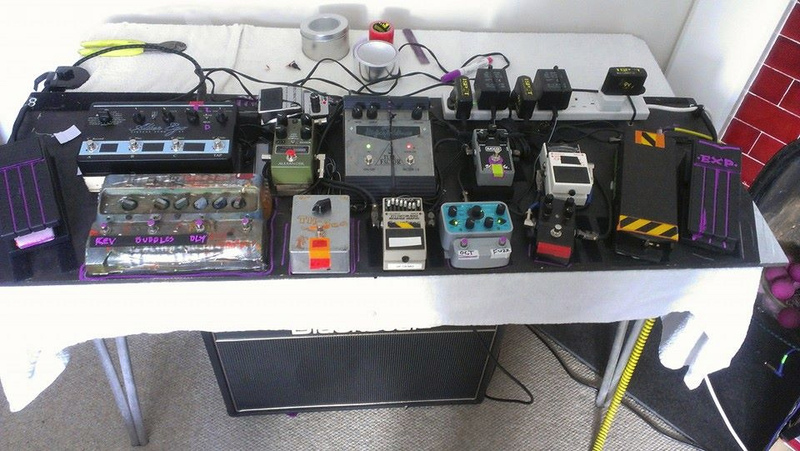 Reeves Gabrels just posted a recent shot of his pedalboard for his Reeves Gabrels and His Imaginary Friends 2015 tour. Those of you not familiar with Reeves Gabrels, he is a fantastic and very influential guitarist. He’s best known for his work with David Bowie and Tin Machine. Reeves is also currently playing with The Cure as well. Busy guy. Also, he’s been promoting his guitar that he collaborated with Reverend Guitar. If Reeves is new to you, please check him out! Now, a couple of the pedals are unidentified, so if you can ID them, please let me know. I put a message into Reeves too, so I’ll update accordingly after I find out those pedals are. Let me know what you think by commenting below! UPDATE: Reeves got back to me last night (9/18) and filled in the missing blanks. Thanks Reeves! Yep.. totally right! Thanks for the comment!